Faster than a speeding airship! More powerful than the final boss! Able to cross from the eastern part of the map to the western part in a single bound! It's Super Console! 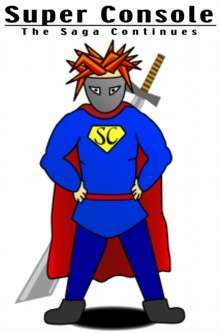 The follow-up to Console (a runner-up for Best Indie Game of 2003), Super Console is a role-playing game that pokes fun at such games as Final Fantasy™, Arc the Lad™, and Shining Force™. If you've ever wondered what the characters do after the game is over (or just want to know what the heck people who aren't in the active party do to pass their time), this is your game. Super Console is a more or less generic fantasy game, tunable for anything from silly armor-stealing hilarity to deep, thick, gooey plots to Diablo™-like monster smashing. Super Console completely overhauls the game engine for greater scalability. It also includes two new classes (the Adventurer and Dark Knight), more detail for Tasked characters (including Living Items! ), more GM advice, optional combat rules, new character sheets, pregenerated stores and monsters, and plenty of new artwork. Super Console is $10 of your hard-earned but well-spent money. It's 141 pages long, and about 7 megabytes. Would this game work with one on one play? The biggest issue with 1:1 play would be in monster balance. I think you'd want to either tone down the damage that monsters deal, or raise the Main Character's HP - otherwise they'll be overwhelmed by numbers too fast. why does the RM have no armor options in the base store lists? My apologies, I must have overlooked that! Ten years and no one noticed. I'll have to see if I can even open the old files for this product and add RM to the list. Until then, I recommend letting the Red Mage use the same armor as a Thief. thank you, based on the class description for Red Mage I thought it was fighter armor but thief armor tends to fit their nature as jack-of -all trades.